If your itinerary takes you to Hua Hin next, your guide can arrange a downtown Hua Hin drop off for you! 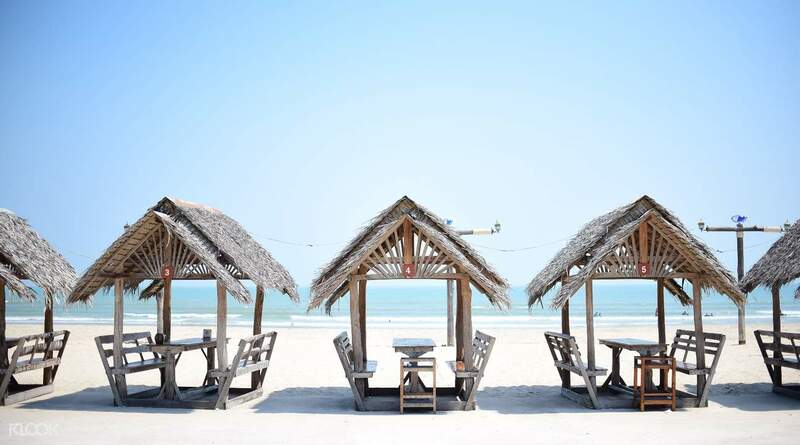 Book Enjoying the Slow Relaxing Life in Hua Hin Private Day Tour by AK and travel with just you, your family and friends! 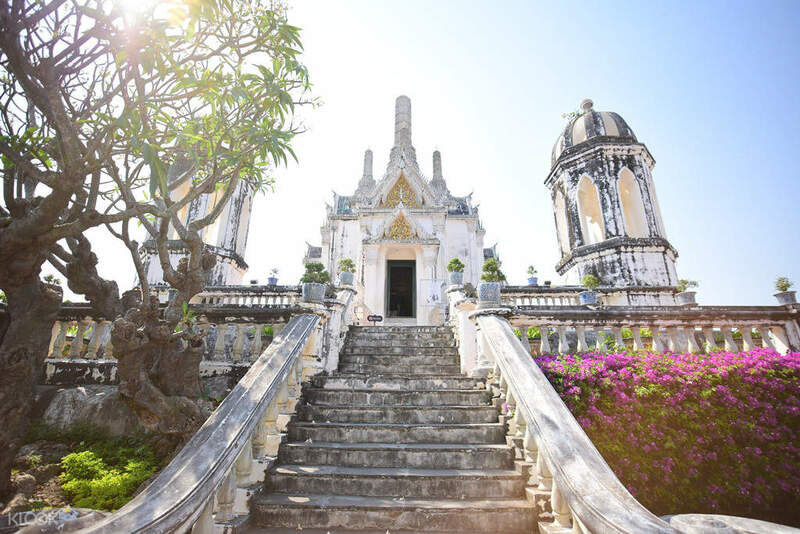 Explore Hua Hin on a wonderfully immersive adventure taking you to some of the city’s best sights. Start the day departing Bangkok and heading for Phra Nakhon Khiri, a historical park that is filled with palaces, temples, royal halls, pagodas, chedis and other buildings in either the classical Thai style, European neo classical, or Chinese style. 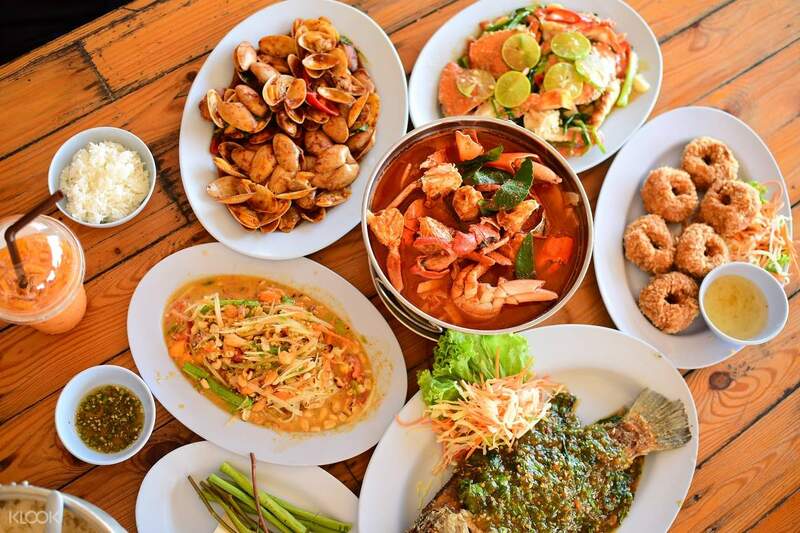 Next stop is the White Beach Seafood Restaurant where you can taste authentic Thai food at very affordable prices. You will then move on to Plearn Wan, a relaxing space filled with rustic charm and designed to model a 19th century village. Here you can find loads of souvenirs from vintage toys and clothing to antiques. 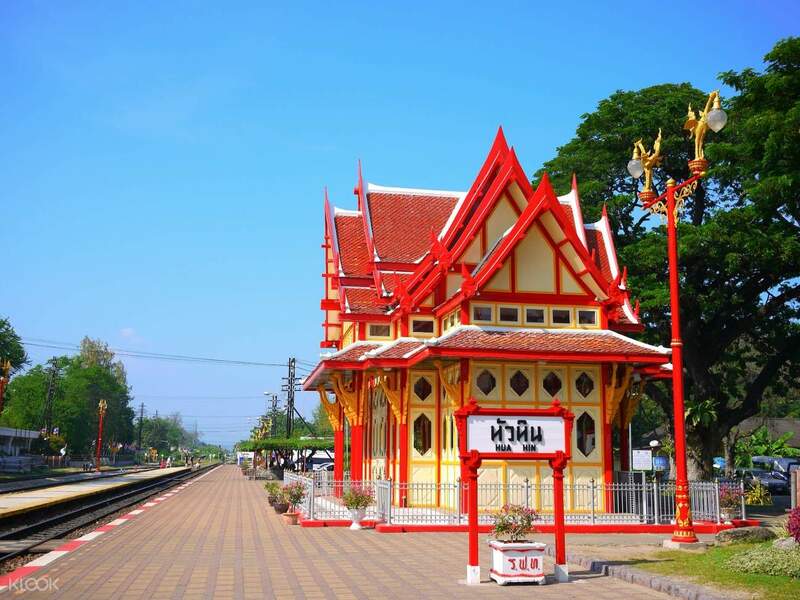 One of the big highlights of the tour is a stop at Hua Hin Railway Station, a unique historical landmark with over 100 years of history, one of the oldest railway stations in Thailand. 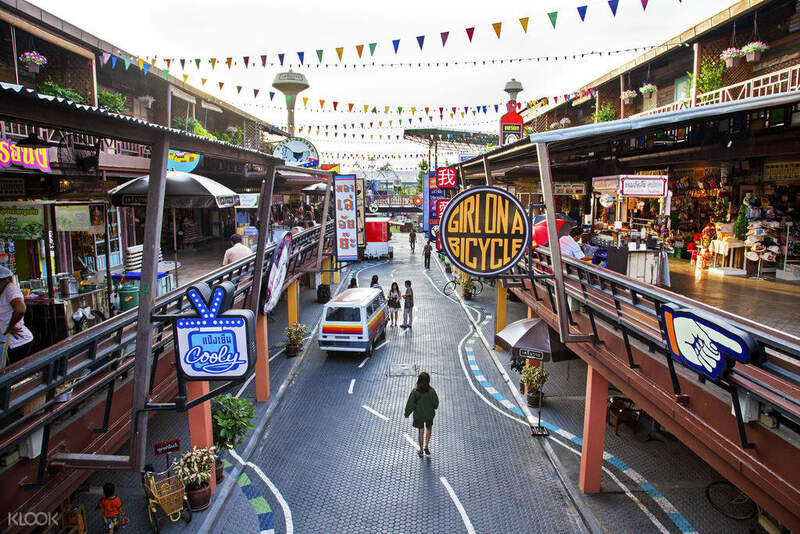 The tour concludes with a visit to the Chang Chui Plane Night Market where you can find a nice selection of shopping and dining, combined with modern art pieces mostly made from recycled materials. Afterwards, join the return transfer to Bangkok or arrange with your guide to be dropped off in Hua Hin. Warning: this tour will fill up the storage space in your memory card. Ensure you have enough storage space in your phone/camera for photos! The tour was awesome.... we spent full day at the greatest places in Hua Hin. our tour guide also very helpfull and care to all participant. Tye lunch was very tasty of fresh seafood. We lpve it! Thank you. The tour was awesome.... we spent full day at the greatest places in Hua Hin. our tour guide also very helpfull and care to all participant. Tye lunch was very tasty of fresh seafood. We lpve it! Thank you. love the plqce so much! santorini be-a-like :)) so white and beautiful! love the plqce so much! santorini be-a-like :)) so white and beautiful! A perfect way to spend a day outside of Bangkok. Finding the Klook booth took a bit of effort. Turns out it is located inside the mall next to the Tourist Lounge and not outside as stated in the email. Nonetheless, the registration was easy and smooth and the tour was conducted professionally as advertised. Our cute and pretty tour guide AOM was wonderful as she took extra effort to talk to each of us and ensure everyone is well taken care of. Love the tour. Recommend. A perfect way to spend a day outside of Bangkok. Finding the Klook booth took a bit of effort. Turns out it is located inside the mall next to the Tourist Lounge and not outside as stated in the email. Nonetheless, the registration was easy and smooth and the tour was conducted professionally as advertised. Our cute and pretty tour guide AOM was wonderful as she took extra effort to talk to each of us and ensure everyone is well taken care of. Love the tour. Recommend. The tour guide Ah-Lu is friendly and helpful. He volunteers to take pictures for us at all the scenic spots. We had a good walk, about 3.5km to three mountain tops to see the Kings Summer Palace, and other two Towers. The views are panoramic! The white beach is beautiful! I like the Chang Chui by night, the atmosphere is relax and chill. The tour guide Ah-Lu is friendly and helpful. He volunteers to take pictures for us at all the scenic spots. We had a good walk, about 3.5km to three mountain tops to see the Kings Summer Palace, and other two Towers. The views are panoramic! The white beach is beautiful! I like the Chang Chui by night, the atmosphere is relax and chill. Enjoyable trip to Hua Hin! Went to places as per itinerary including Hua Hin train station! Tour guide can speak mandarin & english and she's super friendly. Highly recommended tour from Bangkok! Enjoyable trip to Hua Hin! Went to places as per itinerary including Hua Hin train station! Tour guide can speak mandarin & english and she's super friendly. Highly recommended tour from Bangkok! The tour guide is friendly and helpful. The food is extremely delicious. But the tour plan is not interesting, they take us to some lame places. The Changchui night market is good, it has nice design (we came at Halloween), there was an interesting exhibition, but there is not much food there. The tour guide is friendly and helpful. The food is extremely delicious. But the tour plan is not interesting, they take us to some lame places. The Changchui night market is good, it has nice design (we came at Halloween), there was an interesting exhibition, but there is not much food there. Another fun filled day by Klook/AK. Hua Hin is so beautiful, wished we could spend more time there. My guide, Tay, is excellent. He gave me lots of info of the area, plus history and culture..... He made sure I have an amazing time. Another fun filled day by Klook/AK. Hua Hin is so beautiful, wished we could spend more time there. My guide, Tay, is excellent. He gave me lots of info of the area, plus history and culture..... He made sure I have an amazing time.